Crochet coasters are among the easiest patterns to make. At their simplest, they are just circles (or squares or even hexagons), allowing you to play with stitches and texture worked in the round. As you will see with these coaster crochet patterns, you can create crochet coasters that reflect every season or holiday, favorite hobbies and decor style, just by changing the colors and design details and adding edging or stitching. Crochet coasters add style to your table, showcase the theme of parties, and make great gift sets. You can also use coaster patterns to make motifs that can be used in bunting or as wall art. Crochet doughnuts are really popular and of course they are perfect for the kitchen so they make great coasters. Choose a fun, free crochet pattern that includes instructions to make a holder for the coasters when they aren't in use. People always like to crochet fruits and vegetables, and of course they make a perfect theme for coasters, which are most often used during meals. One set of free patterns includes 6 different fruits, so you can mix-and-match designs to make fun coaster sets. What's really great about a kiwi coaster pattern is that you can change the colors on this simple pattern and have an entirely different, creative, crochet coaster. Make crochet coasters that are great for back-to-school patterns and end-of-year teachers' gifts. They are available for sale through Ravelry. One unique crochet coaster pattern uses filet crochet reminiscent of vintage doilies. If you can't read filet crochet charts, that's okay because the designer also includes a symbol chart. This pattern is one of a set of three different patterns that you can mix-and-match for square coasters. Filet crochet is hardly the only technique for making crochet coasters. Tapestry crochet is another great option for a set of coasters that complement one another. Simple crochet circles can easily be made to look like animals simply by adding a face. One pattern–available to download free on Ravelry–is a groundhog crochet pattern that will make your party guests smile as they set their cups down. The tiniest little addition of triangles can make a circle look like a kitten! This crochet pattern, which includes written instructions as well as a symbol chart, is for sale on Ravelry. Make these with or without the cute bow! A stitch pattern uses smart spacing to create a dragonfly (not to be confused with butterfly stitch) that forms the center of a square crochet coaster pattern perfect for spring and summer gatherings. Upcycle plastic bags to create red, white and blue crochet coasters. They also have a matching placemat crochet pattern. This is perfect for a variety of American holidays. The same idea could be used in different colors to make picnic coasters for everyone. The mud cloth crochet pattern is inspired by a bold tribal-inspired design. 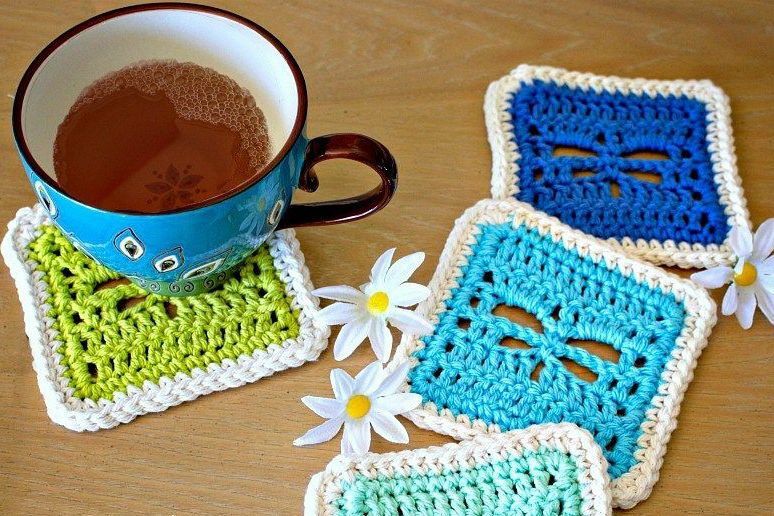 Although it looks intricate, the designer says that these coasters are simple enough for beginner crocheters. Crochet designer Megan Hocking shares, "Mandala coasters remind me of an old ship's wheel and are reminiscent of summer days in the sun." She suggests playing with color changes, including working them in only one solid color. She sells the pattern through Ravelry, where she also sells several other great coaster crochet patterns. A lacy shells crochet coaster pattern is square, with elongated corners, and is made using beautiful shell stitches that give a lacy feel to the design. These coasters work in any setting. X crochet coasters have an original shape that is accented by an X that develops across it as you work the color changes and spaces. This is another design that really works all year round in any setting. It is made using only simple single and double crochet stitches. The terrific texture on a color burst crochet coaster pattern makes for a great cushion for your glass. This free pattern can be worked in lots of different colors! It is also a great free flower crochet pattern.